A Great Big World Interview - Writing "You," "Younger"
Ian Axel (left) and Chad King of A Great Big World. With their worldwide ballad hit “Say Something” (featuring Christina Aguilera) and their debut album Is There Anybody Out There? 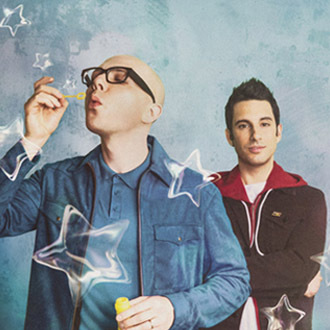 in 2014, A Great Big World (consisting of Ian Axel & Chad King) demonstrated that they are a talented duo who write and perform unique, highly melodic and thoughtful pop songs. Their debut album (on Epic Records) included many quality songs, ranging from ballads (“Already Home,” “You’ll Be Okay”) to uptempo rockers (“Rockstar,” “This is the New Year”). And impressively, “Say Something” earned the duo a Grammy Award for Best Pop Duo/Group Performance. With their second album When The Morning Comes (released in 2015), the duo continued to create quality work, writing songs based on their personal experiences such as “Won’t Stop Running” (about empowering yourself to battle health issues). They also wrote a passionate, sensitive song called “Hold Each Other” (featuring Futuristic). Now in 2018, A Great Big World has released two singles from their latest album project. Their two new songs—“You” and “Younger”—indicate that Axel & King are writing some of their best songs, and seem poised to return with a strong, third album. “You” is heartfelt ballad sung by Axel, about the joyful experience of marrying his wife, and the birth of their son. Notably, A Great Big World has released a deeply personal video of Axel’s family life, including home video footage of Axel with his wife, Lina, and their baby boy, Bowie. ‘Younger” is a fun, uptempo song, with the duo playfully recalling their childhood years growing up, and how they miss those carefree days. Axel & King produced an animated video for this song, that imaginatively inserts the duo into a Mario Bros.-type video game. In addition to these two new songs, A Great Big World has written and recorded a new Christmas song called “Wrap Me Up Under The Christmas Tree,” that will be released soon. On a separate note, Axel & King have written a new song called “Fall on Me” for legendary vocalist Andrea Bocelli’s new album, Si. “Fall on Me” is a key cut that features Bocelli singing a duet with his son, Matteo Bocelli. We are pleased to do this new Q&A interview with Ian Axel and Chad King of A Great Big World. They talk about their new songs “You” and “Younger,” and the videos they filmed for both songs. They also discuss their upcoming album. Note: This is the second article we’ve done with A Great Big World. In our 2017 article, they recall how they wrote their hit “Say Something” and discuss their second album, When The Morning Comes. DK: I like your new song, “You.” It’s a personal, touching song about Ian’s family. What inspired you to write this song? Ian Axel: Thank you. Chad (King) came over to my apartment when my wife was pregnant, and he showed me this idea that he was writing on the guitar, and we felt really pulled to it. We started writing it, and all of a sudden we had the (chorus) lyric, “There was you…you…you” (he sings it). And then we stopped for a second, and it just hit me. I don’t remember who said “You, you, you,” but it just hit me because my wife was pregnant, and I couldn’t stop thinking about our (unborn) son, who I hadn’t met yet. And I started thinking about my wife, I started thinking about my friendship with Chad, and I think we both just started crying. I mean, we just knew what this song was about. Sometimes, it just feels like a song writes itself. This is one of those moments…it was really cathartic, a deeply personal song. DK: The video for “You” is beautifully done, with video clips of Ian’s wedding and family, and their baby boy. Did you already have this video footage available to put in this video? Axel: Yes. A lot of the new songs for our upcoming album are really personal songs. We wanted to tell these stories of our lives in a visual way too, so we’ve been compiling video footage for the past couple months and putting them into folders and archiving them. With the video for “You,” we felt like we wanted to continue that, and share as much as we can. We wanted the video to be simple…we didn’t want to force it. It felt like the simplest thing we could do was to use home video footage, and tell the story with a performance in the living room, that changes over time. In the video, you get to see when I was writing with Chad, to when I started dating my wife, to when we got married, and when she got pregnant and we had our son. DK: I also like your song, “Younger,” which is more uptempo. Since you guys are still fairly young, what made you want to write a song about being younger? Chad King: I think when we both hit our 30s—we’re both 33 now—I felt like the Age thing was really settling in. It’s like…we’re not college kids anymore, we’re not even in out 20s anymore. It doesn’t feel the same…we have a lot more responsibility now. And it was kind of taken from that sentiment…we were starting to write this new record, and me and Ian were just feeling overwhelmed. “Younger” was about us wanting to go back to the younger days, when we didn’t have all this on our shoulders. Axel: It was capturing the feeling we had when we were younger, of where we were. I feel like we were more fearless…we had this spark that was more vivid, that’s so easy to sometimes lose as you get older. We wanted to just get back to that feeling, that we could do anything. So we started thinking about our childhood and we started writing about it. DK: For the video of “Younger,” you created a unique version with animation. How did you come up with the idea for this video? Axel: At least for me, when I think about my childhood, one of the first things that come to mind is video games, and even the production of “Younger” is a little video game-inspired, with the synth sounds we used, and the Super Mario reference in the lyric. We just thought…Wouldn’t it be cool if we were eight-bit characters going through a video game, trying to capture our lyrics and getting points for that. So we found an animator who knocked it out of the park. DK: Your new songs “You” and “Younger” provide a very good start for your next album. Is your new album done, and when will it be released? Axel: Yeah, our new album is done. We don’t have a release date yet, but we’re looking (for a release) after the New Year. It’s a special album for us, because it’s the first one that was produced by the band. And we recorded it with the band—the same band that we tour with and who we’re really good friends with. King: For this new album, we really wanted to step back and go back to writing to write [for the love it], instead of writing to write for radio (airplay) or for the label or management. Axel: We took a step back and said, “Let’s write the songs that we wanna write, that we find joy in writing.” And that’s why “Younger” was the first song we wrote, because it’s getting back to that spark, and that song opened up the rest of the album for us. And you know, we kind of pushed back and didn’t get (many) opinions…we just kept the opinions and the feedback to the small group of people around us that we trusted, and that was it. King: When you get a lot of feedback, everyone has their own opinion, and at the end of the day, it was sort of me and Ian, that we had to trust our own. When we wrote “Say Something,” we weren’t trying to write a radio song. We were writing that song because we needed to write it for ourselves…it was our therapy. And then we got to share that, you know, with the world. And so we went back to that philosophy and we’re really proud of it. We can’t wait for people to hear it. Me,” which was co-written by Ian Axel & Chad King. DK: You mentioned that you produced your new album with your band members. Can you talk about the members of your band? Axel & King: Yeah, totally. Zach Jones plays drums, Chris Kuffner plays bass, and our guitarist is Oscar Albis Rodriguez. The guys didn’t just stick to their instruments—they played synths and multiple instruments. We were just all in the room and creating together. We recorded at our favorite studio in New York, called Studio G in Brooklyn. DK: Thank you Ian and Chad for doing this interview. Is there anything else that you’d like to mention for this article? Axel: Besides working on our own album, we were pleased to write a song called “Fall on Me,” that Andrea Bocelli recorded for his new album, Si. DK: How did you hook up with Andrea Bocelli? Axel: Someone on his team reached out to us, and asked if we’d like to attempt to write a song similar to “Say Something,” which is a difficult feat (laughs). But we had an idea, and we kind of wrote it with Andrea’s voice in our head. We wrote it as a duet, and we sent it to him as a duet between a male and a female. Then they came back and asked, “Hey, can you write this song for Andrea to sing with his son, Matteo?” And so we rewrote it as a father/son duet and they released it. We’re really happy with the way it came out, and it’s been a key song to promote his album.